Open in 1991 and with 2 Michelin stars under its belt ever since 1998, The Square has a track record which speaks for itself. Restaurants so often come and go in this industry. Few however have the longevity which chef and co-owner Phil Howard has maintained over the decades at this Mayfair classic. Regarded by many in the trade as the epitome of the ‘chef’s chef’, Michelin star success hasn’t seen Phil Howard abandon the heat of the stoves for the bright lights of the TV cameras. Apart from the odd appearance on The Great British menu and Masterchef, word has it he still spends most of his time in the kitchen doing what he loves most. But it isn’t provocative combinations or innovative techniques that customers continue to come back for. Neither is it The Square’s formal and spacious dining room which may come across as a little intimidating to some. What you will be treated to here though is some of the most delicious, seasonal and perfectly executed Modern French cuisine out there. At culinary school, I was lucky enough to train under a chef who was an alumnus at The Square. Hence, the style of the food here is something I can relate to as a cook more than any other haute cuisine restaurant out there. I’ve come to appreciate how difficult it is to nail that wonderful air-light foam that still packs a punch of flavour…. or that delicious sauce with it’s flawless consistency, shine and balance. The Square hits home on all of this and more. There’s nothing on any of the plates leaving the pass that’s there just for the aesthetics. Every element from the main protein to the respective garnishes have their place – tasting absolutely amazing in their own right and when eaten together. With each successive bite, the freshness of the ingredients, faultless technique and impeccable seasoning will undoubtedly shine through. 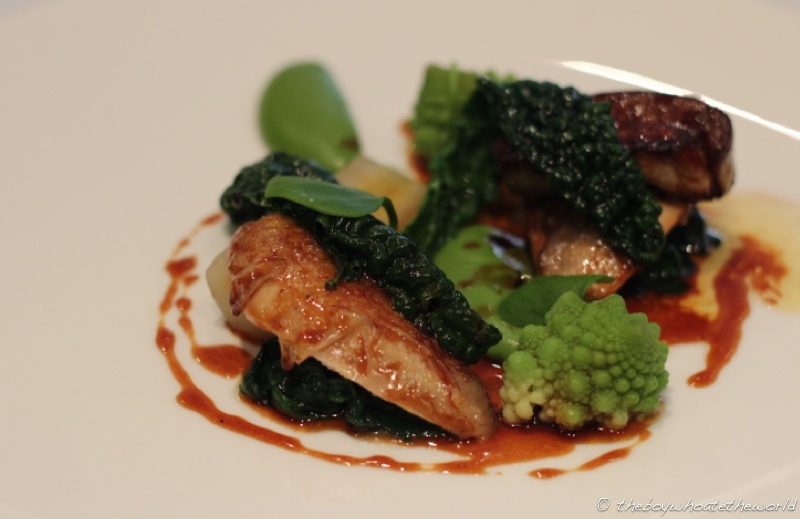 Whereas many of London’s best restaurants restrict their set lunch menus to just weekdays, The Square is one of the few Michelin star restaurants around that offer their set lunch deal on weekends as well. And at £35 for 2 courses and £40 for 3 courses, it’s an absolute steal for the quality you get. Our Roast Mackerel starter was cooked perfectly – the skin crisp and the flesh still moist and flaky. The richness of the fish and smoked eel were balanced beautifully by the sweetness and acidity of the pickled beets and the creamy, spicy notes from the horseradish cream. Their Chicken and Foie Gras Ballotine also impressed – the chicken was incredibly moist whilst the crisp tartness of the Waldorf Salad cut through the creamy foie gras core nicely. Things only got better with the main courses. Quail breasts, often so easy to overcook were succulent and just slightly undercooked as it should be. All the other elements from the silky-smooth wild garlic puree to the seared foie gras to the exquisite sauce complemented the quail harmoniously. The Salmon confit was equally as brilliant. Still moist and delicate from the confit process, it was a joy to eat with the shellfish-based sauce and sweet, juicy Cardigan Bay prawns. 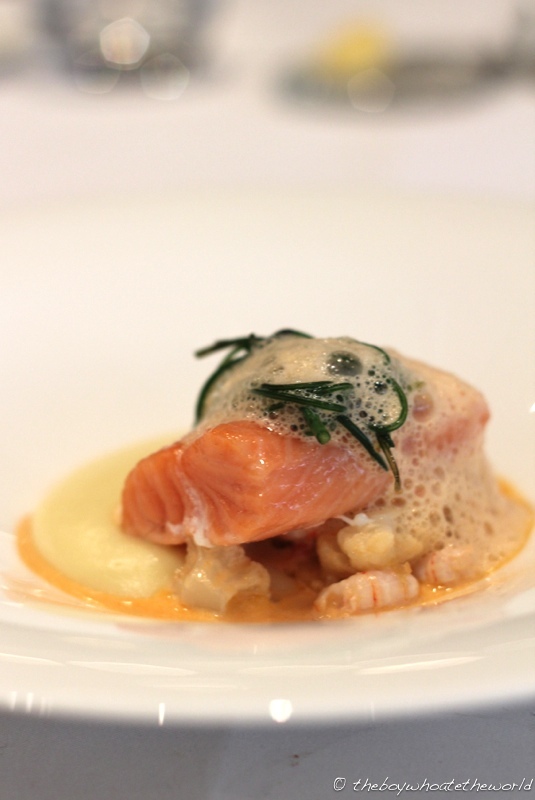 The icing on the cake was the lemon foam on top – airy and bursting with citrus to cut through the richness of the salmon and creamy potato. 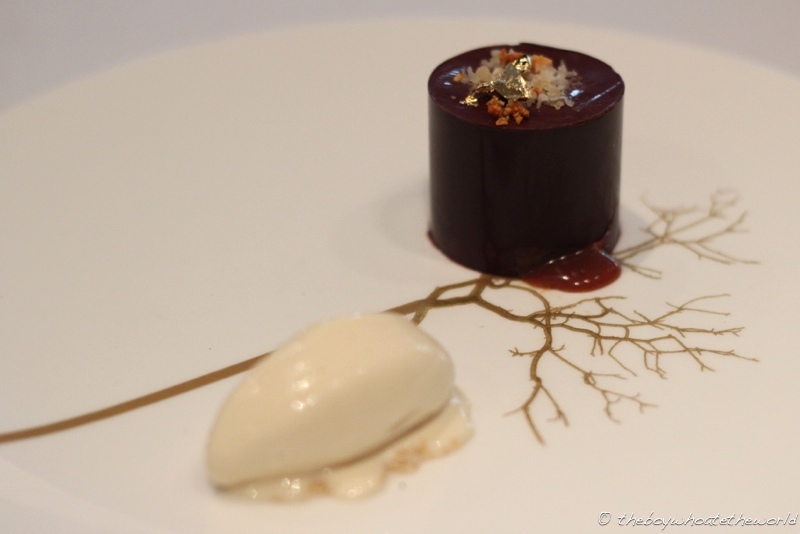 A lush Chocolate Delice with Macadamia nut ice-cream rounded off a quite stunning meal. Not much of a sweet tooth myself, I was pleasantly surprised by how well-balanced all the flavours were. The bitter note from the dark chocolate helped to take the sweet edge off the caramel and banana filling. A very accomplished dessert on the whole. Full marks also to their front of house team for their extremely friendly and attentive service throughout. The bill arising from our set lunch menu and two glasses of wine were never going to compare to the tasting menus and multiple bottles of fine wine being enjoyed on neighbouring tables. However, at no point were we made to feel like second class citizens here despite us opting for a more budget 2 Michelin star experience that day. If the set lunch menu is anything to go by, this is easily some of the most delicious food you will find anywhere in the capital. I found myself sitting back after each and every course thinking ‘Woah, that hit the spot’. With such world-class cooking, I’m a little surprised that 3rd Michelin star has continued to elude them. Time to start saving up for their full blown 9-course tasting menu I think. Yes, I agree the service & food at the Square is impeccable. I’ve had some wonderful memories of the food & great company of my friends whilst dining there. @Jolene: Everything is always cooked so perfectly her isn’t it 😉 Thanks for stopping by the blog.